Freelance Mazda specialise in replacement hoods for your MX5 or Eunos Roadster. Our replacement hoods are manufactured in the UK from the finest materials. Your replacement hood will be fitted and your car will look like new once again. We are proud to say..."Made in England"
Our cables are tension tested to 35kg, have an aluminum block for positive retention, wire gauge increased over Mazda original for added strength. 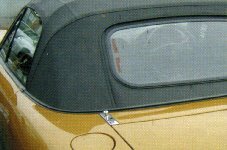 Plastic coated wire for less friction against internal hood damage . These cables are sold individually if required. Price: £ 10.50 (each) Please state year of car when ordering. 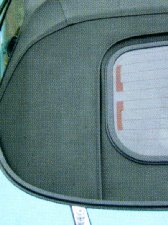 Advice only: please consider the age of your vehicle and reflect on the fact that the hood tension cables may be the existing cables from new, therefore may have served their life span .. it may be advisable to replace these at the time of the hood installation .. these cables run inside the hood above the door opening. For more information about our hoods, or any other query, please contact us.